Alma Wilford Richards was a gold medalist in the high jump at the 1912 Olympic Games in Stockholm, Sweden. He was Utah’s first gold medalist. He was a member of The Church of Jesus Christ of Latter-day Saints. Richards was born on February 20, 1890, in Parowan, Utah, to Morgan and Margaret Richards. He dropped out of school when he was in eighth grade (age 14), but Thomas Trueblood, a professor at the University of Michigan, encouraged him to return to school. He attended Murdock Academy, a private school for grades 9 through 12, located in Beaver, Utah. One of his teachers asked Richards if he would join the track team. Richards knew little about athletics, but he joined the team, entering multiple events. He soon scored enough points to win the Utah state team championship for his school. Not long after this, Brigham Young University coach Eugene L. Roberts saw Richards playing basketball and asked him to jump over a six-foot-high bar. When Richards cleared it easily, Roberts began working with him and began raising money to fund Richards’ trip to the 1912 trials. At the Stockholm Olympics, Richards wasn’t considered a serious contender. He had an unorthodox style—leaping with his body erect and his legs crossed under him—and had been able to compete only because a U.S. Commissioner who had seen him jump had insisted that he be included. Richards successfully made his way to the finals, one of two men left competing for the gold medal. Before his final jump, Richards walked to a spot on the infield grass, and in full view of the stadium crowd of 24,000, he took off his hat, kneeled on the ground, and prayed: “God, give me strength. And if it’s right that I should win, give me the strength to do my best to set a good example all the days of my life.” He said amen, put his “lucky” hat back on, walked to the end of the runway, and, without hesitation, raced for the bar. He cleared it at 6-feet, 4-inches to set a new world record and earn the gold medal. The Olympics boosted Richards’ confidence beyond his small town farm boy beginnings. He graduated from Brigham Young University in 1913 and from Cornell University in 1917. He continued his athletic life and was AAU high jump champion in 1913. 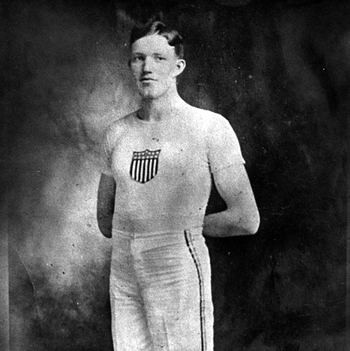 He became a decathlete and won the national decathlon championship, finishing 500 points ahead of Avery Brundage, who would later head the International Olympic Committee. Throughout his athletic career, he won more than 245 medals and trophies in track and field events worldwide. Richards attended graduate school at Stanford and earned a law degree at the University of Southern California. Instead of practicing law, he decided to teach science and taught at Venice High School in Los Angeles until he retired. Richards was married twice. He married Marian Gardiner and they had one daughter. His second wife was Gertrude Huntimer and they had three children. Richards died on April 3, 1963, and was buried in his hometown’s cemetery. He has posthumously been inducted into the Utah Sports Hall of Fame, Helms Hall of Fame, Brigham Young University Hall of Fame, and the U.S. Track and Field Hall of Fame. This page was last edited on 5 June 2014, at 14:27.